Now his thirteenth year as a teacher at the Academy, Ciaran Gourley has tasted MacRory cup success as both a player and a coach. 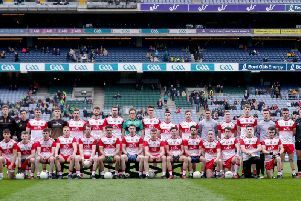 The Tyrone triple All Ireland winner was corner back on the 1997 team that captured the school’s second MacRory Cup and later the first Hogan Cup. Eleven years later he would repeat the feat as co-manager, and was also at the helm when the Dungannon school made it back to back Ulster titles in 2009. “It’s nice to look back at the successes of the past, but they’ve made their history and had their day in the sun. “There will be occasions where they can meet up and look back at past glories and good memories. “But it’s up to these boys to say ‘We’d like to create our own bit of history ‘That’s what you hope to have’. Gourley is well aware of the reputation of the competition, and what it means to the school as a whole. “There’s no doubt about it, because of the profile the MacRory cup gets, with the media exposure and TV coverage. Not just the he whole school, but all their clubs and families weigh in behind them, so it certainly is a big occasion. ‘Throughout the league campaign it was a mixed bag. Against Armagh we played some great football early on but then tailed off. “Then we lost heavily to Omagh and Maghera, and I suppose it maybe put a wee bit of doubt into the players mind that maybe they weren’t up to that stand. “Over the Christmas training, we saw a change in the performance levels, and thankfully they carried that on to the knockout games. “I suppose not too many people will remember the early stages; it’s all about the knock-out part of the competition. We’ve managed to get to the final, but we know we have a tough game against Cavan. “There have been aspects to improve upon. In the game against Magherafelt our start wasn’t particularly good, and that was something we wanted to have rectified for the next match. “You have to look at things to improve and make them that wee bit better. “Again, in the second half of the semi-final, after a good start we perhaps sat back. We can’t afford to do that against Cavan because they have some really decent forwards. “They will punish us if we’re too casual and don’t push on. There are lessons to be learned in every game and hopefully there’ll be another one for the final” added an optimistic Gourley, below.